Finding the distance between two points isn't as hard as the formula may seem. The distance formula is: d=√​(x​2​​−x​1​​)​2​​+(y​2​​−y​1​​)2. When solving for the distance between two points, you can also make a triangle (on a coordinate plane) and find the rise and run of the legs. Then, you can use Pythagorean Theorem (a2+b2=c2)to find the hypotenuse, the straight-line distance between the two points. Try it for Yourself #1 - Find the question mark! 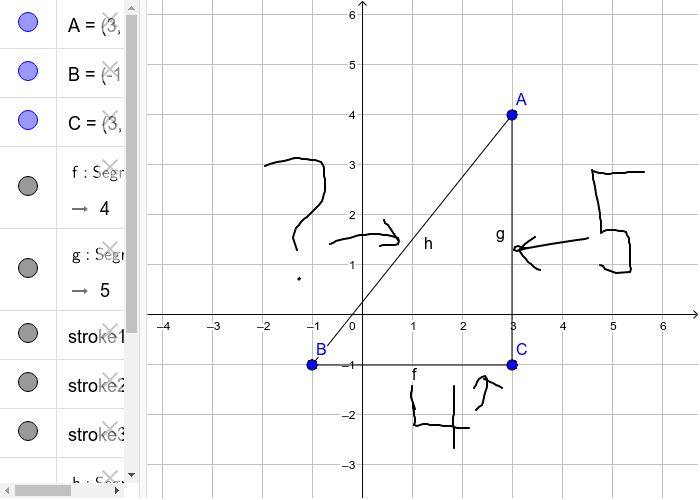 In the problem above, you are trying to find the hypotenuse, or the distance between points A and B. So, you use the Pythagorean Theorem and solve for the missing side. Since you know the two legs, square each of them (BC=16, AC=25), add them, and then take the square root of them added together. Thus, the distance between A and B is the square root of 41, which equals roughly 6.4.